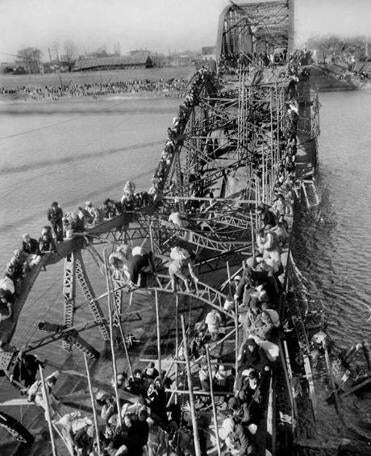 In 1950, Mr. Desfor climbed a 50-foot-high section in order to photograph refugees fleeing for their lives across a bridge along the Taedong River that had been damaged by bombing. WASHINGTON — Photographer Max Desfor, whose photo of hundreds of Korean War refugees crawling across a damaged bridge in 1950 helped win him a Pulitzer Prize, died Feb. 19 at his apartment in Silver Spring, Md. He was 104. Mr. Desfor, a photographer for the Associated Press, volunteered to cover the Korean War for the news service when the North invaded the South in June 1950. He parachuted into North Korea with US troops and retreated with them after forces from the North, joined by the Chinese, pushed south. Mr. Desfor climbed a 50-foot-high section of the bridge to photograph the refugees as they fled for their lives. The Pulitzer board honored his overall coverage of the war, based on a portfolio of more than 50 photos, and cited the Taedong River bridge shot in particular. A native of New York, Mr. Desfor was born in the Bronx on Nov. 8, 1913, and attended Brooklyn College. He joined the AP in 1933 as a messenger. After teaching himself the basics of photography and moonlighting as a baby photographer, he began shooting occasional assignments for the AP. He became a staff photographer in the Baltimore bureau in 1938. During World War II, Mr. Desfor photographed the crew of the Enola Gay after the B-29 landed in Saipan from its mission to drop an atomic bomb on Hiroshima in August 1945. He was with the first wave of Marines at Tokyo Bay shortly after Japan’s surrender that month and photographed the official surrender ceremony aboard the USS Missouri on Sept. 2, 1945. After the war Mr. Desfor served as supervising editor of Wide World Photos, the AP’s photo service, and returned to Asia in 1968 as photo chief for the region. He retired from the AP in 1978, then joined US News & World Report as photo director. Mr. Desfor and his wife, Clara, raised a son, Barry, of Wauconda, Ill. She died in 2004. In January 2012, Mr. Desfor and his longtime companion, Shirley Belasco, married. Belasco died in 2015.